Tinkering in the Kitchen at ASPAC 2018 — Wonderful Idea Co. This past week I was in Taiwan for the annual ASPAC ( Asia Pacific Networks of Science Centers) conference at NTSEC (National Taiwan Science Education Center). 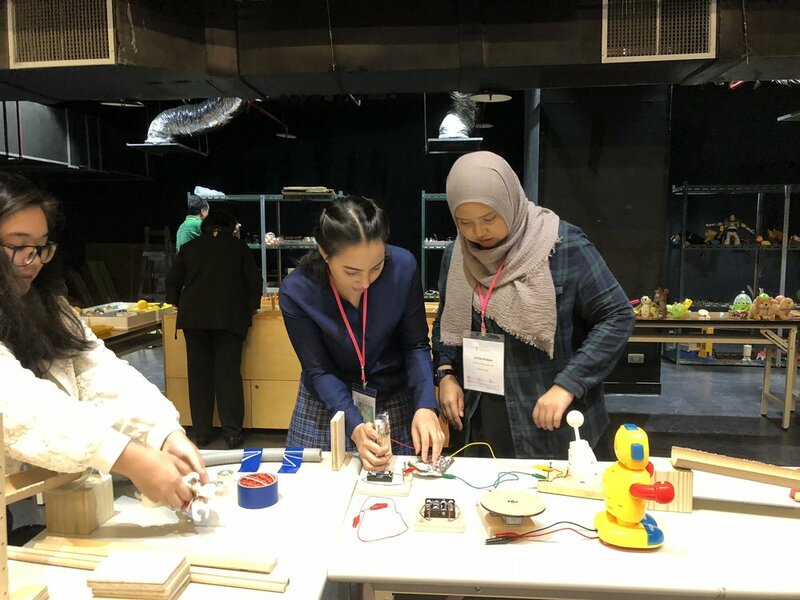 The theme of the conference was Innovative Science Cuisine and I partnered with Fatin Iesa from Science Center Singapore and Yi-hsuan Lin from NTSEC to lead a pre-conference workshop on tinkering. We planned to combine a fun introduction to tinkering workshop with ideas about how to add in a food theme to the activities. On the first day that I arrived at NTSEC we toured the brand new temporary tinkering exhibition. 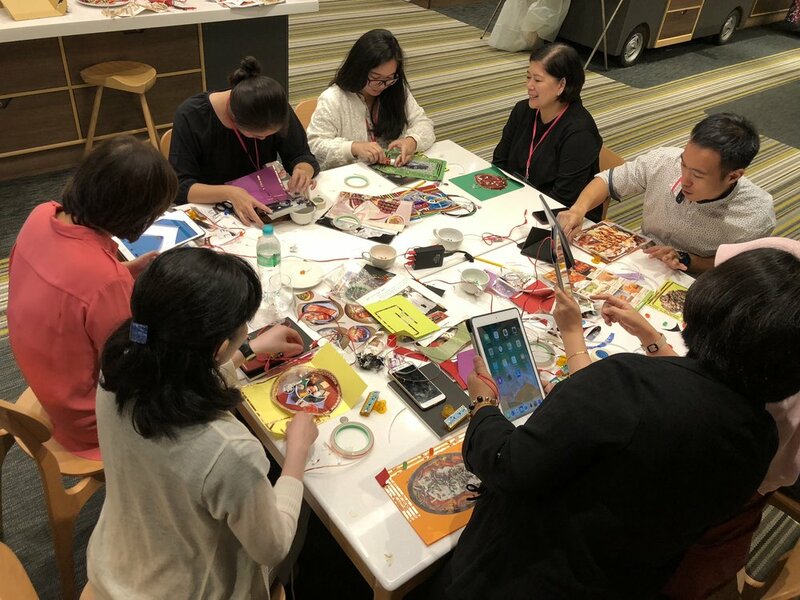 I was part of the Tinkering Studio team who led a professional development workshop with educators and designers in taiwan a year an a half ago and it was amazing to see the progress they’ve made to design an engaging and inviting space. In the tinkering space there is six workshop spaces for scribbling machines, chain reaction, light play, marble machines, wind tubes and happy city. 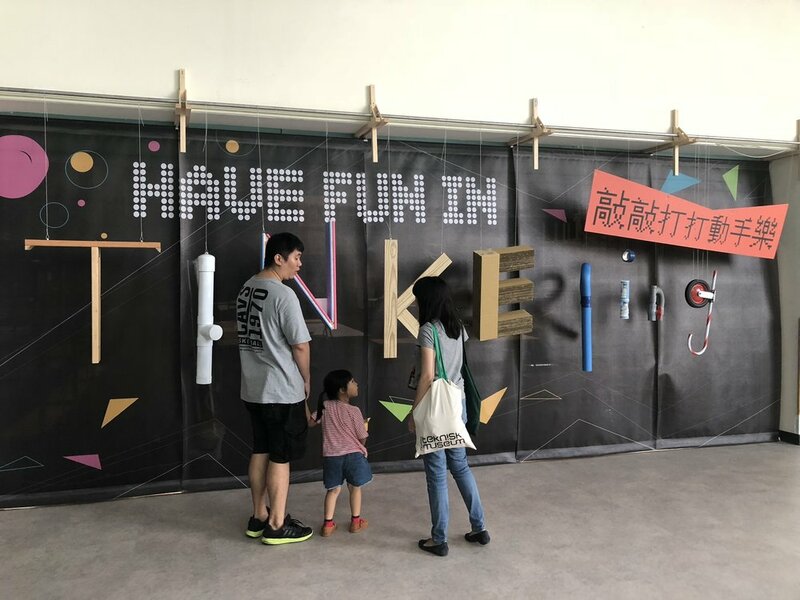 They used lots of refurbished furniture and exhibition elements, created a bunch of innovative circuit boards and set aside an artist corner which contribute to a scrappy, friendly space where learners ideas are at the center of the environment. The day before the workshop Fatin, Yi-hsuan and I prepared examples, set up workshop materials in both the tinkering exhibition and the science kitchen and did some last-minute shopping for tinkering supplies and secret ingredients. 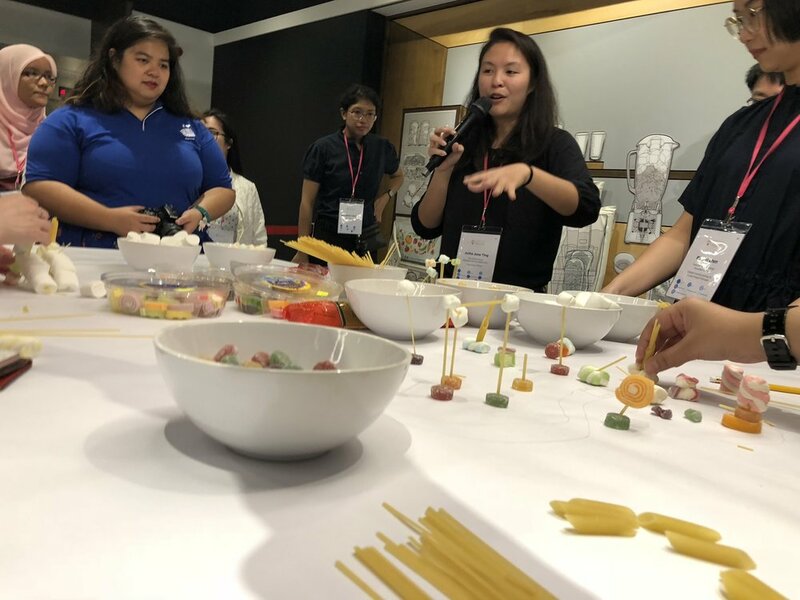 On the pre-conference workshop day, Fatin started us off with a hands-on building activity with marshmallows, gummies and pasta. People worked in pairs to construct something that told a story from their home to contribute to a collaborative village. It was a playful way to get started thinking with our hands and sharing personal stories. As well it helped us introduce learning goals for tinkering and how they might be in contrast to typical engineering challenges with similar materials. Next we moved to identifying more ideas around tinkering through the project zero compass point thinking routine. There was a wide variety of experience levels around the room and it was interesting to see initial thoughts on the topic. For the first full on tinkering activity of the morning we introduced working with paper circuits using collaged photos from food magazines as a theme for the projects. We worked for about half an hour with a limited set of materials to get a light to turn on and tell a bit of a story. After the coffee break we introduced the possibility of working with chibitronics chibichip and programming as well as setting up a soldering station to make their electronic connections more permanent. There were some really fun projects that incorporated initial programming experiments and more complicated circuit designs. We were unsure about the topic and connection to food at first but it was super fun to create these “chibi-cookbook” prototypes. After lunch we moved to the tinkering space to creat a chain reaction machine. 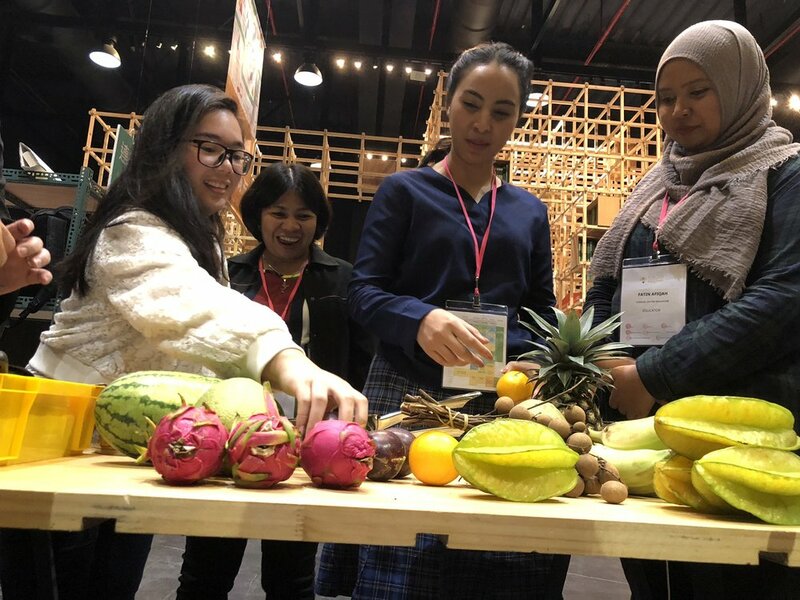 We came up with the theme of taiwan tropical fruit and asked each group to incorporate two different types of fruit into their machine. Right away it was great to see so much collaboration within the groups as they started planning out their sections of the rube goldberg machine. The team at NTSEC had a great collection of mechanical and electronic materials to browse for the projects. There were some really innovative uses of the culiary ingredients. I was especially tickled by the watermelon switch, a passion fruit penduluum nad a toppling dragonfriut that tumbled end over end down a half pipe tube! We worked for about a hour and a half and then went around the space to describe each section of the machine before setting off the chain reaction. We actually did a second set off for the videographers and it was nice to see how some of the elements worked for at least one of the trial runs. At the end of the workshop we went around the circle with the thinking routine of parts, perspectives and you. It was great to hear about the future ideas and plans for the group to think about tinkering in different settings. 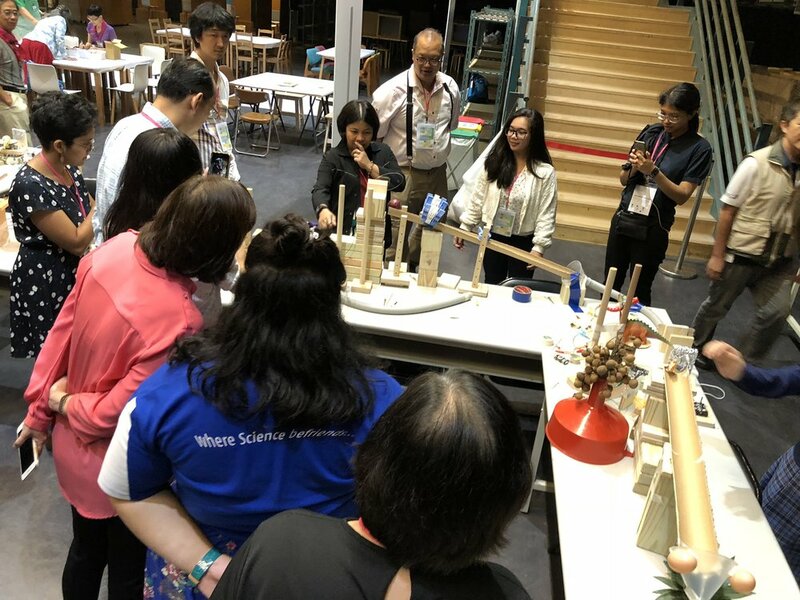 Over the rest of the ASPAC conference, there were lots of interesting conversations about tinkering in museums, integration of technologies and how to create more opportunities for creative expression in science centers. We’re excited to see how many of these ideas progress across the region.